The four preliminary round groups for the Women's 19 EHF EURO 2017 in Slovenia this summer will be drawn on Thursday, 20 April, in Paris. 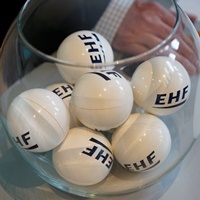 The draw will be streamed live on the EHF EURO Youtube channel. The 16-nation tournament takes place in the Slovenian city of Celje from 27 July to 6 August. Slovenia as organisers as well Denmark and Russia, the teams ranked first and second at the Women's 17 EHF EURO 2015, were directly qualified. 13 joined them following the qualification tournaments. At the final tournament, the first two teams of each group qualify for the main round which consists of two groups with four teams each. From these two groups, again the first two will qualify for the semi-finals.